Hermit's Peak Press is proud to present original voices of northern New Mexico. Las Vegas, New Mexico in the 1950s was, and still is, two towns – Old Town and New Town with a rich Hispanic and cowboy culture as well as a beautiful high plains drifter's setting from which you can see Hermit's Peak, still one of the most haunting images of the American West. All of this is not lost on Alice Winston Carney who grew up in this mysterious and historical milieu of artists, trappers, cattle owners, urbanites, college professors, authors and barroom storytellers. It is very satisfying to know that Alice Carney's world pretty much is the way it was, with very little affectation but perhaps a littler more sophistication than when she was growing up in the fifties. Did she encounter Wonder Woman, the ghost of Teddy Roosevelt (the Rough Riders joined up in Las Vegas), La Llorona the Spanish under-the-bridge female spirit with no face? Did little Alice find her horse? Her first boyfriend? Her lost chameleon? Or did she wash away in soap bubbles in the basement of her elementary school? She tells us in prose as clear as a Sapello stream. 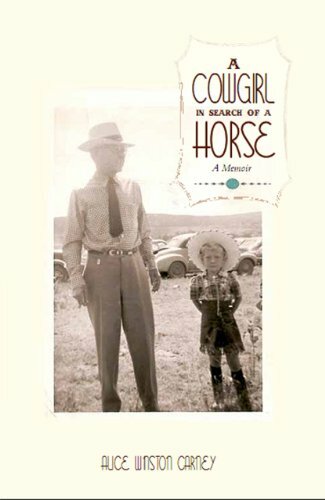 ". . .In this collection of stories, A Cowgirl in Search of a Horse, Alice Winston Carney blends just the right amount of realism with childhood wonder, as we listen to the voice of a young girl acquaint us with simpler times growing up in a small town out west. . ."
"Her language is gently poetic and fits each age she is remembering, and never looks down from an adult height. If you want to re-enter your own childhood in your own town with your own unique household of characters then read this story of hers and your head will swim with things you haven't enjoyed thinking of in a long time." "This is a must book for someone who experienced High School in the 50's. I could almost hear "Blue Berry Hill" playing as I read the pages. The book is filled with images of the author's life experience which so connected me to many of my own images that I almost felt like a participant in her story. Thank you for taking me down your memory lane and causing me to re-visit mine."